Home » Giant » offline contest » Sunsilk » WhatsApp » Peraduan Sunsilk Perapi Di Sisiku Contest: Win a Shopping Spree worth RM1,000! Peraduan Sunsilk Perapi Di Sisiku Contest: Win a Shopping Spree worth RM1,000! 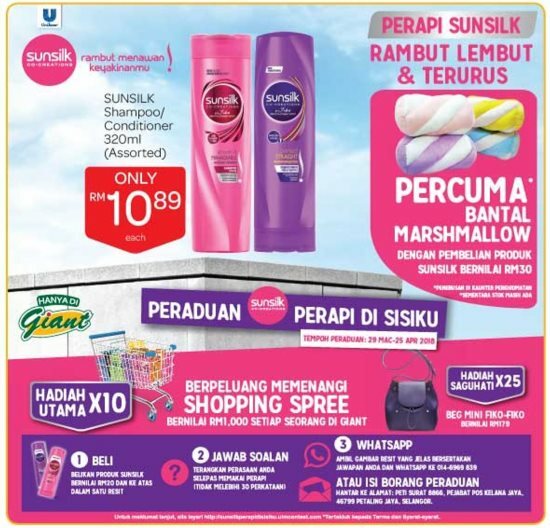 Buy any Sunsilk product worth RM20 and above in a single receipt from Giant. WhatsApp your answer together with a photo of your receipt to the WhatsApp number on the Contest Form, OR you may fill up the Contest Form and mail it to the address on the Contest Form.